Leah and Michael (with Benny and Barry in the background) at last year's Emergency Services Show. As we get ready for this year's ESS, here's an outline of what to expect there for those who haven't been before. Last year, the show moved to Hall 5 of the NEC due to the increase in number of exhibitors. This year, there's over 450 stands, 80 of which are exhibiting there for the first time; as we were last year. Included in those 450 exhibitors are staff associations, charities and voluntary sector organisations, trade journals and of course, emergency service providers and private companies. It's a great place to see what kit is available for the emergency services sector. Everything from tiny drones up to huge fire fighting vehicles that look like they're straight out of 'Thunderbirds Are Go'. With plenty of other types of equipment suppliers there too; from boot and clothing to fire extinguishers and of course, bariatric mannequins. Here's a link to a short video of last year's show. There's also CPD seminars open to all visitors of the show, from Health and Well-being to Lessons Learnt. The College of Paramedics are also offering free CPD point-accruing workshops. See the link for more information. West Midlands Fire Service will be hosting an Extrication challenge as well as a First Aid and Trauma challenge. And there's the Collaboration Zone where you can learn how charities, the voluntary sector and government partners work together with the emergency services. It's also a great place to network with new contacts or meet up with familiar faces. Having just mentioned the West Midlands Fire Service, I'll remind you that this year Bariquins is at Stand P37 which is directly facing the area in Hall 5 where West Mids exhibit their vehicles. Barry and Benny shouldn't be too hard to spot. We've taken Barry (above) and Benny (shown below) on a couple of photo shoots recently. Barry had to be extricated following a collision whilst in his Vauxhall Corsa. Meanwhile, Benny had to rescued from the first floor of a house after he collapsed whilst doing a bit of construction work. I'm happy to say that both were rescued safely. The images are for our new brochure which we're currently preparing and it will be ready in time for the Emergency Services Show. So come along to our stand, P37, if you want a hard copy of the brochure and see more images of Barry and Benny. It will be available online when production has finished. Bariquins are currently in discussion with an organisation concerning a potential training partnership. 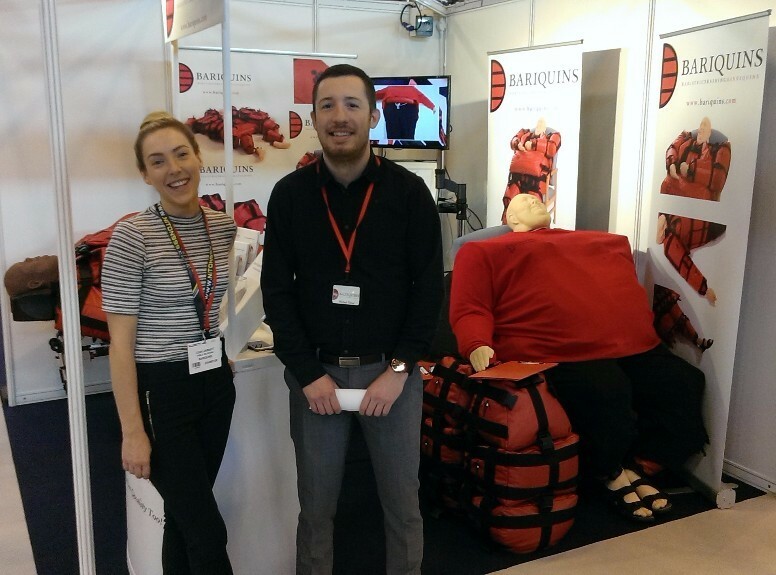 Should these discussions be successful, Bariquins will be able to offer bariatric moving and handling training with CPD Accreditation, provided by the potential partner. We will report on the outcome of these negotiations in due course via our newsletter. So, please keep watching this space.